14/11/15 . HAWICK. Mansfield Park, Mansfield Rd, Hawick TD9 8AW. BT Premiership Rugby Union. Hawick v Gala. Ali Weir for Hawick. The sky’s the limit for Hawick, according to full-back Ali Weir, who believes he and his Teri teammates have what it takes to make history on multiple title fronts this season. In the great quest to put last season’s disappointment behind them and reset the standards of Hawick rugby, the Mansfield Park club sit nestled comfortably in a position of power, ready, according to Weir, to compete for an unprecedented treble in 2015. 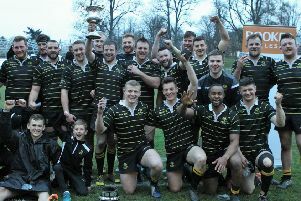 As the team prepared for Saturday’s Skelly Cup Boxing Day clash with Jed-Forest, Weir told us: “We’re still in three competitions and, as a playing group, we’ve stated we want to go for all three,” said Weir, who is adamant the Robbie Dyes can realistically compete for Border League, Cup and BT Premiership glory. Hawick sit just five points off the league play-off places, six behind leaders Gala in the Booker Border league – having played a game less – and will enter the cup in the third round when the competition kicks off in February. “Border derbies are always tough, everyone raises their performance, but we are taking Saturday very seriously,” added Weir. “It’s a Skelly Cup and Border League game at the end of the day, against a team who have been going pretty well this year in National One. “Jed are a tough unit who would love nothing better than to knock off a Premiership side. Melrose, fresh from an impressive away victory over Heriot’s in the Premiership last weekend, which moved them to within five points of leaders Ayr, are also aiming for Border League glory this season, while looking to rest some weary bodies ahead of an important New Year schedule. “With the league structure being the way it is, we have some bruised bodies and we will be looking to give some boys who haven’t played in a first team Melrose jersey this season a chance,” said Melrose head coach John Dalziel, ahead of Saturday’s Waverley Cup match against Gala at the Greenyards. “We have a seconds team who are leading their league and five or six boys from there are really pushing to get a shot on Saturday, and help us close the gap on that top spot.